Patrickswell Brownes: Where in County Limerick? After David Brown listed the possible early ancestors in County Limerick, he gave more specific information about the first immigrants to America and when they may have emigrated from Ireland. (See copy of the letter at the left.) I tried to follow his path and located 1860 census records in Columbus, Ohio and Chicago, Illinois. I also located baptismal and marriage records in St. Patrick’s Catholic Church in Columbus, Ohio. I will share those specific records when looking at each of the family members – each is very interesting in their own way. But, like David, and many new genealogists, I most wanted to know where they actually came from in Ireland! David gave information for each of the immigrants in the suspected order of their birth including estimated birth dates and, if not specific, at least estimated death dates for all. I tried to locate death records for each of them, but, either could not find records, or they died too early to have actual death certificates where birthplace and parental information is given. As David stated in his letter, it is pretty difficult to identify birth records in Ireland without the names of both parents, especially with a common surname such as “Brown”. Finally, something specific I could easily find! 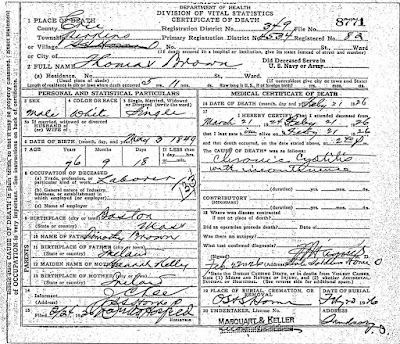 The Ohio death records were not online at that time, (they are now available at FamilySearch.org), but records from this time frame are available at the Ohio Historical Society where I obtained a copy of the death certificate. 1 (See copy at the right.) It did give the names of the parents! The father was listed as Timothy Brown and the mother as Hannah Kelly. Disappointingly, the place of birth was given as Boston. I also questioned whether this was, indeed, the correct family since the David Brown letter never gave the mother’s name as anything other than Johanna. Also, the Boston birthplace implies that the father could have emigrated with the rest of the family but that did not fit in with other information in the letter. Johanna/Hannah could have been pregnant with Thomas as she made the crossing which would have been very risky. 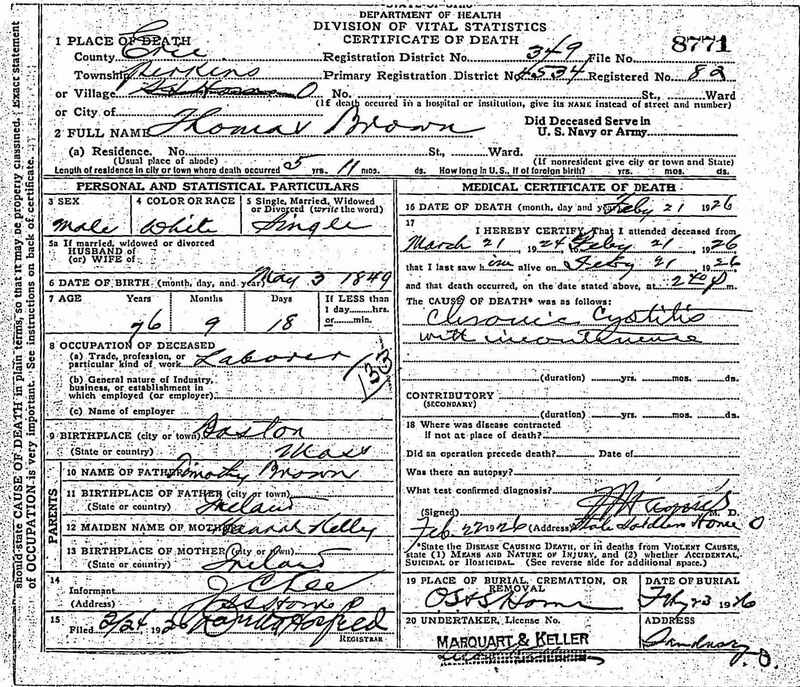 However, the 1880 census does show “Hannah” Brown living with Patrick Brown, in Saybrook, Illinois. I believed this to be the oldest son. Because I wasn’t getting any further with my research on this side of the ocean, I decided it was time to see what was available at the Limerick Archives. Not that I wanted to spend the money for something that I was far from sure of, I had also heard that the Archives were going to be closing which gave further impetus to sending for the information. So, in December 2003, I wrote to the Limerick Archives and received a very quick response. The next post will identify the contents of the response . . .